Today’s Album Of The Week is Ricky Nelson’s "Ricky"LP from November 1957. Next to that, you’ll hear some rock and roll and rockabilly rarities, as well as some “pearls” from the ACE label. 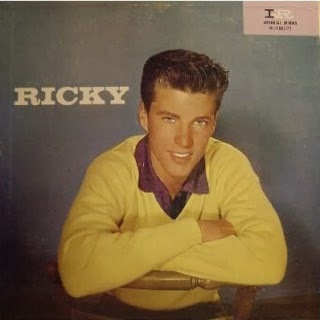 Disque "fil rouge" pour aujourd'hui: "RICKY", le 1er 33T IMPERIAL de Ricky NELSON , mis sur le marché en novembre 1957. En complément, vous aurez droit à des raretés rock and roll/rockabilly comme s'il en pleuvait, ainsi qu'à plusieurs "perles" du label américain ACE. 2. Ricky NELSON (Jimmie Haskell Orch. & Chorus) - "Honeycomb"
3. Carlos DIAZ With The ROYAL TONES - "Sugaree"
5. Ricky NELSON (Jimmie Haskell Orch. & Chorus) - "Boppin’ The Blues"
6. Lonnie MILEY - "Satellite Fever – Asiatic Flu"
7. Huey "Piano" SMITH - "Rockin’ Pneumonia And The Boogie Woogie Flu (Pt. 1)"
9. CURLY SANDERS - "Brand New Rock And Roll"
10. The ROCKIN’ CONTINENTALS - "Cobra 289"
11. Ricky NELSON (Jimmie Haskell Orch. & Chorus) - "Have I Told You Lately That I Love You"
12. "LONESOME LONG JOHN" ROLLER - "Long John’s Flagpole"
13. Ricky NELSON (Jimmie Haskell Orch. & Chorus) - "Teenage Doll"
14. Bob GADDY - "Slow Down Baby"
15. Tommy CASSEL - "It Ain’t What You Got"
16. Ricky NELSON (Jimmie Haskell Orch. & Chorus) - "If You Can’t Rock Me"
17. Nelson RAY - - "Walkin’ Shoes"
18. The DEL-MINGOS - "Hop, Skip And Jump"
19. Ricky NELSON (Jimmie Haskell Orch. & Chorus) - "Whole Lotta Shakin’ Goin’ On"
20. Jack KITCHEN With The ROCK-A-BILLIES - "Hot Rod Boogie"
21. Tony CASANOVA - "The Grave"
22. Ricky NELSON (Jimmie Haskell Orch. & Chorus) - "Baby I’m Sorry"
23. Joe TEX - "You Little Baby Face Thing"
24. LENNY And The STAR CHIEFS - "My Queen And Me"
25. Ricky NELSON (Jimmie Haskell Orch. & Chorus) - "Am I Blue"
26. Beecher HICKMAN - "Hey Blues"
27. Frankie FORD With Huey "Piano" Smith And Orch. - "Sea Cruise"
28. Ricky NELSON (Jimmie Haskell Orch. & Chorus) - "I’m Confessin’"
29. Sonny WALLACE - "Black Cadillac"
30. MORGUS And The THREE GHOULS - "Morgus The Magnificent"
31. Ricky NELSON (Jimmie Haskell Orch. & Chorus) - "Your True Love"
32. The TWILITERS With Bill KENNEDY - "Move It"
33. CHAVIS BROS. - "Love Me Baby"
34. Jack FACE And The RUSTIC ECHOES - "Walk ‘Em Off Blues"
35. Jack FACE And The RUSTIC ECHOES - "Long Gone Daddy"
36. Jack FACE And The RUSTIC ECHOES - "Three Years"
37. Ricky NELSON (Jimmie Haskell Orch. & Chorus) - "True Love"
38. Jack HUDDLE - "Starlight"
40. The CREW - "Red Chevrolet"
41. Bobby LAWSON - "Baby Don’t Be That Way"
42. Glenn MOONEY - "Come Over Rover"
43. Charlie GRACIE - "Crazy Girl"